He’s one of the most iconic villains in cinema history, and fans of Star Wars have been clamoring about the return of Darth Vader to the silver screen since the first trailer for Rogue One: A Star Wars Story was released in August. And while the Sith Lord doesn’t return to the frozen world of Hoth in the stand alone Star Wars tale, he will be making an appearance on the ice in northeast Pennsylvania when the Wilkes-Barre/Scranton Penguins host Star Wars Night on Saturday, January 7 against the Binghamton Senators. Penguins players will be wearing specially produced Star Wars jerseys for the game, featuring a unique rendering of Darth Vader incorporated with the team’s familiar yellow triangle crest. The jersey was designed by Dave Filoni, executive producer of Star Wars Rebels and the head of Lucasfilm Animation Ltd. LLC. 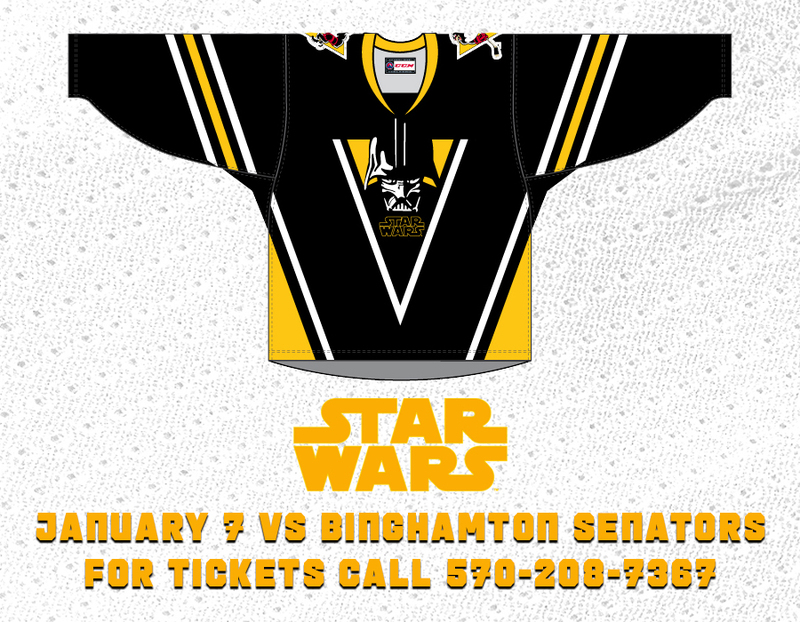 The jerseys will be auctioned off during the game against the Senators, with all proceeds going to Ronald McDonald House Charities of Northeastern Pennsylvania, Inc.
Additionally, approximately 50 members of the 501st Legion Garrison Carida and Rebel Legion Ghost Base groups will be on hand in full costumes, depicting favorite heroes and villains from the Star Wars saga. Ewoks, wookies, jawas and stormtroopers, among other characters, will be available for photos and fun throughout the night. Tickets for the Penguins Star Wars Night are available now by visiting TicketMaster.com or by calling 570-208-7367.